Today’s comic is inspired by sad things that happened to people who should have been able to just have fun. To the many gardens we walk in, tend to and find shelter in. To the shady grotto and the windswept plains, tended hedgmazes, alpine meadows, to bright grass dotted with picnics and communities at play. To the shapes and spaces that own us bone-deep, even when far way. To the seeds we plant, and the ground we water. Sometimes life can do rough things that are not fair. Sometimes some people are treated as less than people and it is not fair. People get treated horribly for lots of silly reasons, like who they love or the color of their skin or the shape of their face or parody puppet stereotypes about their culture or religion. It’s not fair and sad and scary, and limits the joy of the world. It can get a bit much sometimes, especially when people get hurt. It can get a bit much sometimes, and when it gets a bit much one thing that can help is to think of the real and metaphorical seeds that can be planted, and to share stories and poems. One famous story teller is Jalāl ad-Dīn Muhammad Rūmī, we often call him Rumi for short. Rumi was a poet from a long time ago. Like Bunson he liked dancing very much. He wrote about many things, including love and spirit and change. He wrote a poem about an interior peace. Of tales told and sadness left behind like water and new seeds growing. Tales often need to be told for the past to find peace and the river flow properly. 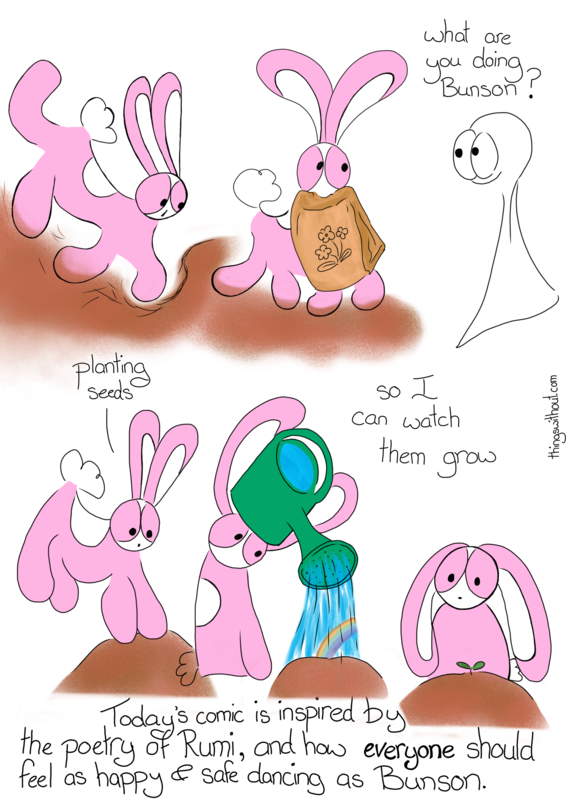 Seeds must be planted and tended to if we wish to watch them grow. This life of ours needs many wild gardens, plants tended with love, people to help with the planting and harvest, see through the dry times with us, a biodiversity so we can be strong and not struck by blight. Much love, may your gardens be bright and delicious, shady in the noonday sun, may you feel safe and whole and seen in your skin.